I decided to test my spouse's theory that everything goes better with bacon. We had a bag full of broccoli from the farm share, and I used the stems for another recipe, saving the florets for tonight's pizza. Then the grocery store had mushrooms and fresh mozzarella on sale, so I couldn't resist. Love those mark down stickers. Add a couple of slices of bacon from the freezer stash, a bit of red onion, and we're good to go. It did occur to me to throw on some raisins, but I resisted the impulse. Another time. I'm saving my all-purpose flour for cookies, so this dough is made from King Arthur White Whole Wheat. It works great, even if my circle is decidedly square-ish. I really cheesed it up (that sounds so not right) by sandwiching the toppings between a base of fresh mozzarella and a lid of shredded fontina. The garlic is un-smashed in this photo. Preheat the oven to 450 degrees Fahrenheit and a small skillet over medium heat. In a tiny bit of oil or bacon grease, sauté the mushrooms until they give up their juice, about 5 minutes. Add broccoli, stir, and sauté until bright green, about 3 more minutes. Sprinkle with a pinch of salt. Set aside. In a small bowl, smash the garlic clove into the warm olive oil. On an oiled sheet of parchment paper, stretch dough out in a shape that works for you today. 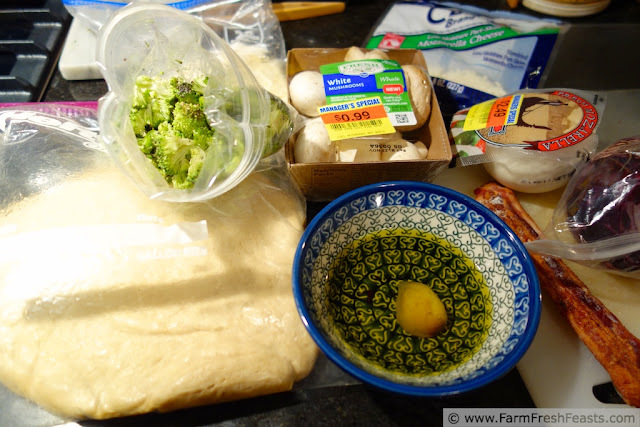 Brush the garlic oil across the crust. Top with slices of fresh mozzarella--not too close to the edge! It will spread! 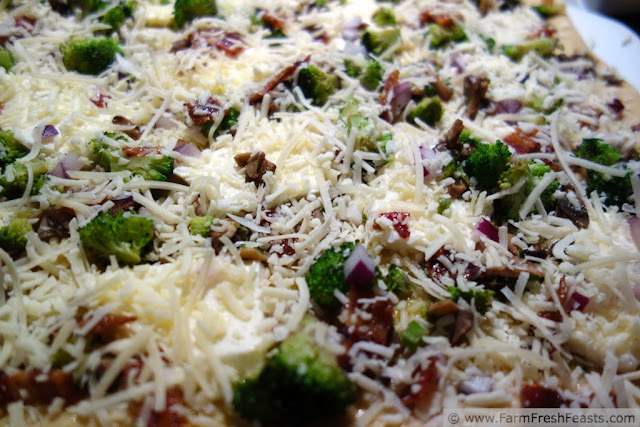 Scatter the broccoli-mushroom mixture evenly across the crust. Top with red onion and bacon. Add fontina over top. Top with a few grinds of pepper. Bake for 5-8 minutes on parchment, then slip the crust off the parchment and directly onto the stone. Bake an additional 3-5 minutes until cheese is browned and bubbly. Cool on a wire rack then slice and serve. This post is linked with What's In The Box and Taste and Tell Thursdays! There were no complaints. And very little leftovers, come to think of it! 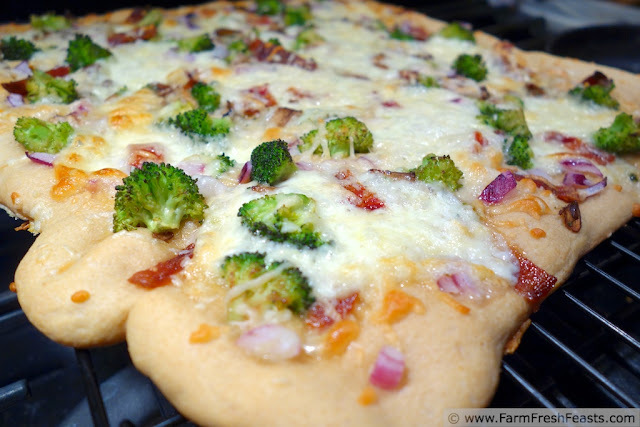 I am always looking for different pizza toppings - I need to try this one! Thanks so much for sharing at Taste and Tell Thursdays! Thanks for hosting--I'm learning so much and seeing such great photos at your parties!